Joining your friends together for amazing outdoor ventures calls for the right sport utility vehicle (SUV) crafted with abundant room for seating everyone and carrying all of the stuff you may or may not use. Toyota has you completely satisfied on spaciousness, specifically for lengthy travels, in the form of their latest Sequoia that also looks chic. If your family plays more rugged and loves spending weekends in the wild, then Westbury Toyota recommends purchasing or leasing the authoritative SUV of open-air exploring: Sequoia. When you are operating the wheel of Sequoia, places much further from those typical paths become your next getaway. Its all-aluminum 5.7-liter (L) V8 is Toyota’s hugest and brawniest motor, delivering 381 horsepower (hp) and 401 pound-foot (lb.-ft.) of torque. 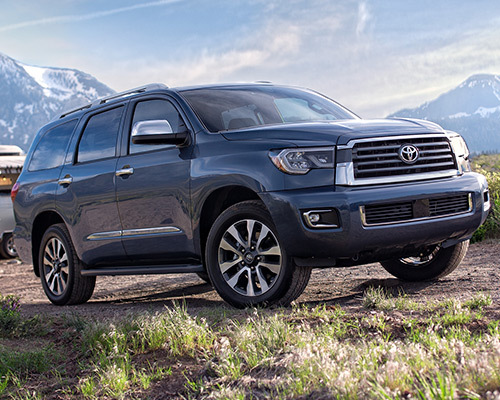 This means purchasing or leasing a Toyota Sequoia of your own is always a smart decision if you want an extra helping of performance and power in either your everyday commute around Westbury or your impending outing outside of city limits. Every trim grade contains a TOW/HAUL Mode to optimize transmission shift points when carrying heavy cargo and Trailer-Sway Control (TSC) for monitoring engine torque. In addition, the available Multi-Mode 4WD system gives you maximum traction on slick or uneven surfaces. If your impeding voyage a far distance from Westbury winds up taking you on the road less visited, you cannot go amiss with having the productivity and operating potency of a Toyota Sequoia on your side. Laid out to comfortably sit eight and contain 120 cubic-feet (cu.-ft.) of luggage volume, the all-new Sequoia accommodates both passengers (even furry companions) and belongings. Slide and push down rear seats to rework the positioning and place items exactly how you want. Moreover, an available power-reclining third-row seat enables you to configure extra space by effortlessly touching a button. 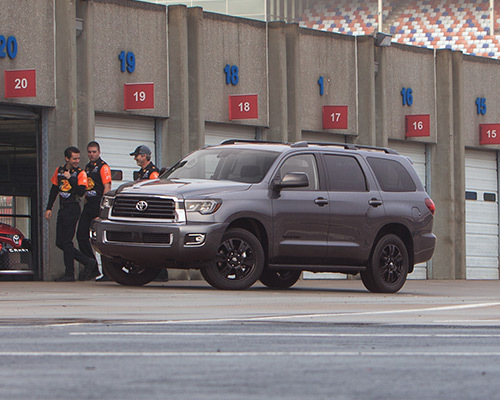 Which Toyota Sequoia Version is the Supreme Match for You and Your Family? You will enjoy traveling inside the Sequoia SR5 featuring easy-clean chairs enclosed in fabric, automatic three-zone climate control, Entune Multimedia Bundle, and power-tilt moonroof with sliding sunshade. There is no uncertainty that the variety of Toyota Sequoia SR5s displayed on the Westbury Toyota lot for purchase or lease will vastly meet the specifications of Westbury drivers who want the perfect joining of functionality and luxuries. As Toyota’s sportiest SUV in history, TRD Sport helps motor vehicle fanatics rule the pack with sport-tuned suspension, 20-inch (in.) black alloy wheels, and Bilstein shock absorbers. If you imagine a SUV that is just as confident on the freeways of Westbury as it is on the paths that await you in the great outdoors, this is the ideal variant for you. Lavish features like two rows of heated seating, a steering wheel adorned in leather, and an automatic power liftgate turn Sequoia Limited into a first-class ride for you and your travelers. For those with a larger family to drive around, owning or leasing a SUV does not indicate you have to forego the top-quality elements presented in the automotive world. You do not have to stress about amusement or connectivity during road trips, either. A Blu-ray Disc player optional with nine-in. monitor lets travelers in the second row play movies or games, while a 14-speaker JBL Synthesis audio system spreads sound throughout the interior. Add on Entune Premium Audio with Integrated Navigation and App Suite to access numerous different prevalent apps and current information, ranging from local weather to gas rates. Towing your treasured weekend toy has never been simpler due to the excellent towing ability revealed in the reimagined Toyota Sequoias here at Westbury Toyota. This tough and sturdy SUV assembled on a fully boxed frame also has the capacity to tow an upper limit of 7,400 pounds (lbs. ), making transporting a boat, trailer, or other big cargo a snap. Are you ready to end leaving behind anything obviously too big to load in the vehicle by using this SUV’s muscularity and performance proficiency to your favor? While quite a few full-size SUVs are not known for their smooth reaction, the Toyota Sequoia virtually glides along the freeway, even when it is loaded down with youngsters, belongings, and whatever else. You can dominate the pathways of Westbury NY and rough terrain throughout your escapades considerably better because of the advanced double-wishbone front and rear suspension. 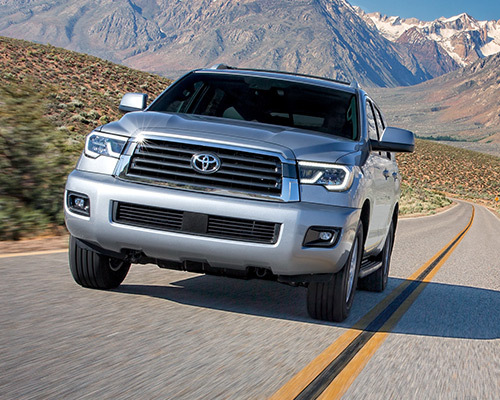 If you would rather not experience the roughness that pervades other competitors in this category, then now is the right time to see how purchasing or leasing a Toyota Sequoia can upgrade your durations spent on the concrete of Westbury. Just like arrangements for getaways, Toyota verified your ride was prepared for whatever could happen. Own or lease the reimagined Sequoia at Westbury Toyota in Westbury NY and successfully tackle your upcoming adventures.